A pharmacy technician prepares syringes containing an injectable anesthetic in the sterile medicines area of the inpatient pharmacy at the University of Utah Hospital in Salt Lake City. In hospitals across the country, anesthesiologists and other doctors are facing significant shortages of injectable opioids. Drugs such as morphine, Dilaudid and fentanyl are the mainstays of intravenous pain control and are regularly used in critical care settings like surgery, intensive care units and hospital emergency departments. The distance that medical science has traveled in the past hundred years in pain management is practically miraculous. Walk into a pediatric intensive care unit at any major hospital in the country and, even though the children you'll see are critically ill from disease and surgery, you won't see any of them squirming in the bed in pain or discomfort. Though a child in this ICU may be diagnosed with an incurable disease, pediatric doctors are able to use hydromorphone, fentanyl and liquid morphine to keep the patient's suffering at a distance. The same is true for pain management in adults. And it's not just the patient who is spared — relatives, friends, not to mention doctors, nurses and the other health care providers don't have to experience a cherished human being writhing in agony. That is why doctors across the country have grown increasingly concerned that hospitals and other medical facilities have been running low on or out of the supplies they need. Dr. Red Starks, a pediatric anesthesiologist who has been practicing for 26 years, said that for him, the shortage "escalated late this spring when we didn't have any morphine." "Or one week we had morphine, but we didn't have Dilaudid," he continued, "and two weeks later, we'd get a little trickle of Dilaudid, but we wouldn't have any morphine. And you're just thinking, 'Hello, am I in the 21st century?' "
Starks says that while there have been periodic shortages of pain medications in the past, it has never been this serious. He agrees that, for the most part, patients are largely unaware of these obstacles to their pain management. It's not just anesthesiologists who are affected. Surgeons, emergency medicine physicians, intensive care unit doctors are also impacted. In fact, the number of medical situations where physicians use injectable opioids is considerable. But it is anesthesiologists who are most distressed because it's their job to mitigate patient pain. In an informal survey of nearly 2,500 anesthesiologists conducted by the American Society of Anesthesiologists, 98 percent of respondents said they "regularly experience drug shortages at their institutions." More than 95 percent say those shortages impact the way they treat their patients. Dr. Jim Grant, president of the 53,000-member ASA, says there is reason to be worried. He says every day when they begin work, "we go in [asking], 'What do we have today, what don't we have today?' It's not unusual for me to get a call from the pharmacist, 'We have X number of this left; we're working on somewhat of a contingency plan.' "
Grant says in addition to Dilaudid, morphine and fentanyl, his members report shortages of bupivacaine, a local anesthetic, and the lifesaving drug epinephrine. One reason behind the shortages is pharmaceutical industry consolidation — there are now fewer manufacturers than in the past. Grant explains that a production interruption at any one plant can cascade into a serious shortage. "We need more than one or two factories in the country of our size to be producing some of these essential drugs." As Matt Kuhn with the global pharmaceutical giant Fresenius Kabi explains, the production process is complicated. It is not a simple proposition for one drug company to suddenly pick up the slack if a competitor encounters a big production problem. "Sterile injectable drugs are a complex manufacturing process to begin with," he said, "and then you have to increase production; you're essentially competing within your own factory for space and time." Still, Kuhn said, Fresenius Kabi is trying to help. "In the case of the injectable opioids, we have increased production. We have extended shifts, we have added workers. But one company is not going to be able to completely fulfill all the market needs for clinicians and their patients." Pfizer, one of the world's largest pharmaceutical companies, has had some production problems recently. Pfizer believes it has now resolved its problems, saying in a statement to NPR, "We recognize the importance of these medications to patients and physicians and are committed to resolving these shortages as quickly as possible." So where's the federal government on all this? On the one hand, the Drug Enforcement Administration is trying to get a grip on an opiate addiction and overdose crisis that is killing thousands of Americans. So the DEA is trying to control supply by limiting the number of opioids produced by manufacturers. On the other hand, the Food and Drug Administration is getting an earful from thousands of doctors, dozens of hospitals and, last but not least, 16 U.S. senators who wrote a stern letter demanding the FDA do something about this injectable opiate shortage. The FDA would like to do something, if it could. Valerie Thompson, the associate director of the FDA's Drug Shortages department, explains, "One thing to remember is FDA doesn't control how much manufacturers make and can't order a manufacturer to make any product. So it's really up to the market." For now, the FDA is concentrating on growing the number of suppliers and searching for and expediting approval of additional sources. But it is no easy task. You can't exactly buy sterile hydromorphone from just anyone. And we are learning more this morning about an opioid crisis different from the one we usually cover. This one is playing out in hospitals around the country. 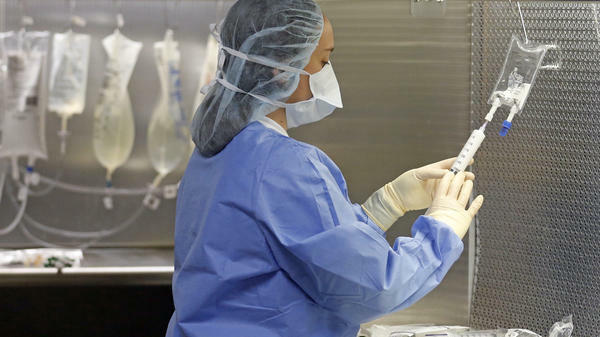 Anesthesiologists and other doctors are facing shortages of injectable opioids. These drugs, like liquid morphine and fentanyl, are used to control pain in critical care settings like surgery, intensive care units and hospital emergency departments. From Dallas, NPR's Wade Goodwyn has more. WADE GOODWYN, BYLINE: In the pediatric intensive care unit at a major Dallas hospital, nurses attend to their small patients. UNIDENTIFIED NURSE: You doing OK? GOODWYN: These are critically ill children with both medical and surgical problems. The injectable pain medications morphine, hydromorphone and fentanyl are the mainstays of intravenous pain control and sedation in critical care settings. And across the country, hospitals and other medical facilities have been running low and out of the supplies they need. RED STARKS: It escalated late this spring when we didn't have any morphine. GOODWYN: Dr. Red Starks is a pediatric anesthesiologist who's been practicing for 26 years. STARKS: One week, we had morphine, but we didn't have Dilaudid. And two weeks later, we've got a little trickle of Dilaudid, but we didn't have any morphine. And you're just thinking, hello, am I in the 21st century? GOODWYN: Starks says that while there have been periodic shortages of pain medications in the past, it's never been this serious. Patients remain largely unaware of these obstacles to their pain management. Hi there, I just wanted to let you know we've been running low on pain meds is not the conversation starter anesthesiologists are going to use with their patients in pre-op. Of course, it's not just anesthesiologists who are affected. The number of medical situations where physicians use injectable opioids is considerable. But it's the anesthesiologists who are most distressed because it's their job to mitigate patient pain. Dr. Jim Grant is president of the 53,000-member American Society of Anesthesiologists. JIM GRANT: Now we have it every day. We go in - what do we have today, what don't we have today? It's not unusual for me to get a call from the pharmacist, we have X number of this left, we're working on a somewhat of a contingency plan. GOODWYN: Grant says in addition to Dilaudid, morphine and fentanyl, his members report shortages of bupivacaine, a local anesthetic, and the lifesaving drug epinephrine. Why? Well, pharmaceutical industry consolidation means where once there were many manufacturers, now there are a few. So a production interruption at any one plant can cascade into a serious shortage. GRANT: We need more than one or two factories in a country of our size to be producing some of these essential drugs. GOODWYN: You might think that if one drug manufacturing company is having serious production problems, it's an obvious opportunity for competitors. But the industry says that's not the way it works. Here's Matthew Kuhn, with the global pharmaceutical giant Fresenius Kabi. MATTHEW KUHN: For a company like Fresenius Kabi to try and pick up the production slack from another company is complicated. Sterile injectable drugs are a complex manufacturing process to begin with, and then you have to increase production. You're essentially competing within your own factory for space and time. GOODWYN: Still, Fresenius Kabi says it's trying to help. KUHN: In the case of the injectable opioids, we have increased production. We have extended shifts. We have added workers. But one company is not going to be able to, you know, completely fulfill all the market needs for clinicians and their patients. GOODWYN: Pfizer is one of those manufacturers that's had some production issues of late. Pfizer believes it's now got its problems resolved and, in a statement to NPR, said, we recognize the importance of these medications to patients and physicians and are committed to resolving these shortages as quickly as possible. So where's the federal government on all this? On the one hand, the DEA is trying to get a grip on an opiate addiction and overdose crisis that is killing thousands of Americans. So the DEA is trying to control supply. On the other hand, the Food and Drug Administration is getting an earful from thousands of doctors, dozens of hospitals and, last but not least, 16 U.S. senators who wrote a stern letter demanding the FDA do something about this drug shortage, which the FDA would like to do, if it could. Here's Valerie Thompson, the associate director of the FDA's Drug Shortages department. VALERIE THOMPSON: Well, I think one thing to remember is FDA doesn't control how much manufacturers make and can't order a manufacturer to make any product. So it's really up to the market to decide, you know, which drugs to make and how much. GOODWYN: The FDA is concentrating on growing the number of suppliers, searching and expediting approval of additional sources, which is no easy task. You can't exactly buy sterile hydromorphone from the Keebler elves. Wade Goodwyn, NPR News, Dallas. Transcript provided by NPR, Copyright NPR.